A multi-speciality department of dental surgery is providing comprehensive treatment under one roof. The department is backed by Anaesthesiologists and Physicians to provide safe and convenient treatment for High Risk& Trauma Cases. First, we make an opening in your tooth and remove any filling and decay. Then we remove unhealthy pulp with tiny, flexible files. 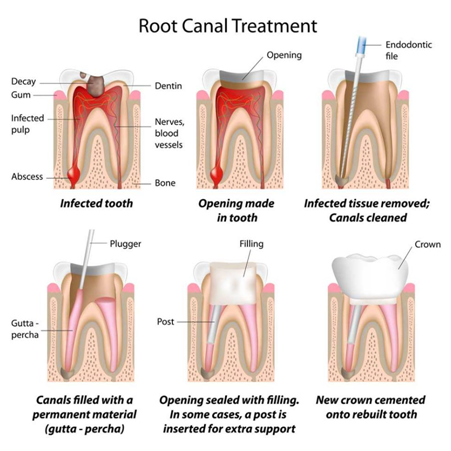 Filling your root canals: After the pulp has been removed, your root canals will be filled. Restoring of the tooth: After the inside of your tooth has been treated, the outside will be restored. To protect the underlying structures of your tooth and give your tooth a healthy appearance, and if your tooth needs extra support, we may remove some gutta-percha and insert a post before the filling and crown are applied. • A post, stainless steel or a tooth-coloured dental material, may be used to fill the opening in the top of your tooth. • A filling, usually tooth-coloured dental material, may be used to fill the opening in the top of your tooth. 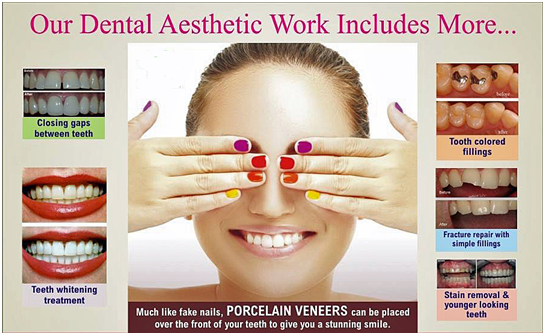 • Porcelain, may be used to cover a tooth that has large opening after root canal therapy. After your root canal therapy, take care of your treated tooth the same way you would your other tooth. Brush every meal, and floss before going to bed. Also have regular dental check-ups, cleaning, and any other dental work you may need so your teeth last as long as you do! Conventional dentistry such as crowns, bridges and Dentures address the short term cosmetic problems of missing teeth, but require grinding down healthy teeth leaving them at a greater risk of cavities and failure. With dental Implants, healthy teeth are not compromised. • It acts as an anchor to support an artificially designed tooth crown. To get look of natural teeth, modern implants are scientifically proven to be the safest & permanent alternative. To increase the life of your dentition along with your natural teeth, implants also require thorough hygiene maintenance. With Implant Therapy you can smile, eat, speak with comfort & confidence, without worrying about your dentures slipping or gaps showing missing teeth. Implants are made from non-coated pure titanium. 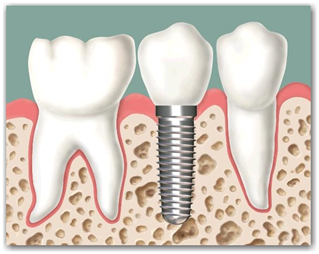 Dental implants replace both the tooth and the root. 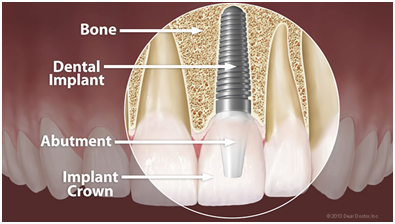 In the first stage an implant is placed directly into the jawbone (implant placement). This step is followed by a healing process (integration period), during which the bone will firmly attach itself to the implant - this can take from 3 to 6 months. During the integration period, the implant is placed below the mucous membrane of the oral cavity, where it is well protected from any stress or infection. A provisional denture can be used during this period. Once healing is complete a crown, bridge or over denture (restoration) can be secured on top of the implant. Follow up care of your implants is simple and straightforward. 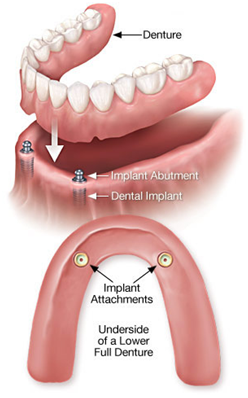 An Implant supported Denture is a type of over denture that is supported by and attached to the implants. It is a specialization of dentistry that involves treating diseases, injuries and defects in the head, neck, face, jaws and the hard and soft tissues of the mouth. As the centre is located within the hospital premises, 24hours emergency services are available for these cases under the supervision of best surgeons, and maxillofacial surgeons. Children have some special dental needs, because they are still growing, and as a result their mouths are actively developing. As children lose baby teeth and develop adult teeth, the care of a paedodontist can ensure that they get to keep their adult teeth for life. Services offered by a paedodontist include routine teeth cleanings, prophylactic care, dental examinations, and recommendations to practitioners who can provide children with orthopaedic care if their teeth or jaws appear to be developing abnormally. Habit breaking devices- helps children stop thumb sacking or tongue thrusting, which can have an impact on their oral health a day their speech.